Around the holidays I have a lot of clients come to see me because it is a very challenging time of the year for them. Others are in a great frame of mind because their past experience with the holidays is one of joy: It’s the old Pavlovian conditioning story and to a big extent, whatever you associate with the holidays becomes your reality. Throughout the northern hemisphere, people have created celebrations that coincide with the winter equinox for thousands of years. Winter is a challenging period because of its dark, shorter days. People have been celebrating to help bring light and give courage to go through this period. Since the holidays return yearly, one of the best things you can do is learn to enjoy them. If you’re a person who has associated stress with the holidays, for whatever reason (family strife, tension, lack of money, too commercial etc), you can find a way to create the reality that would serve you best. To live a fulfilling life we can never be victim we need to empower ourselves by taking charge. What can you do to associate pleasure and the holiday season? Well, you could celebrate in the manner that suits you best. It all depends on your personality and what are your highest values and focus on what would bring you most joy. If you are more of an extrovert and enjoy having people around, have a special meal and invite only the people that inspire you. If you don’t have much money have everyone bring something to eat. Choose the parties to attend that are meaningful to you. 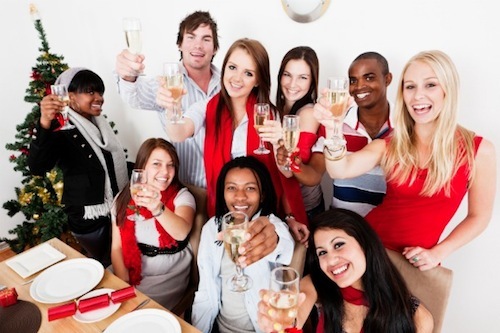 If you must go to social events for career or family obligations, use the opportunity to find someone special to connect with and learn about that person. You don’t need to focus on what you dislike, you can decide to focus on what you enjoy and be grateful for it. If you are more of an introvert, use your alone-time to reflect on the previous year. Pull out your day timer and start planning the year ahead. Put in special projects, workshops, trips and visits that would increase your vitality. Create a “gratitude journal to capture everything that you love and appreciate.” This can make a huge difference in how much you enjoy your year. It’s really not what we have in life that makes us happy, it’s our gratitude for what we have that does. Whether you are an extrovert or an introvert, you can find ways to use this special time to enjoy the people who are important to you. You can use it to rest, plan or celebrate. Making a special effort to dress in a way that makes you feel good can also impact your mood. Have fun, play and be grateful for the gift of life. This is my parting note: Try to imagine what winter would be like without the holidays; without the festivities and break in the monotony of the short darkest days of the year. Aren’t we lucky to have this time? What are your experiences around the holidays? Are they happy or sad? How might they be different this year?